Sirene Belek Hotel offers stunning views, perfect climate and access to 2 championship golf courses; making for a wonderful golf holiday. 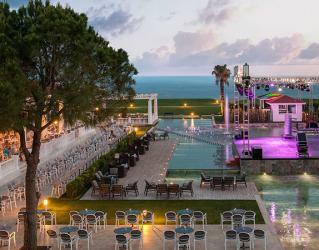 This 5* all-inclusive resort is located between magnificent golf courses and blue Mediterranean waters where you can feel the breeze and smell fresh scent of the pine trees at the same time. The spacious rooms, panoramic views, various culinary options, the beautiful private beach as well as the outstanding championship courses will meet your expectations for luxury golf holiday. All spacious and decorated in a modern way, the rooms and suites of the resort offer golf or nature views; each is a beauty that will take your breath away. 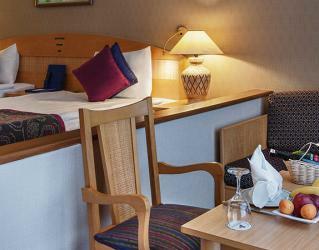 While some of the rooms are located in the main building, some have separate areas throughout the hotel grounds for more privacy. They are all equipped with a LCD TV, telephone, minibar, safety deposit box, internet, bathtub and shower, hairdryer, bathroom toiletries, bathrobe and slippers. Sirene Belek Hotel is in walking distance to the prestigious Antalya Golf Club, home of 2 championship golf courses, the Pasha Golf Course and the PGA Sultan Golf Course. 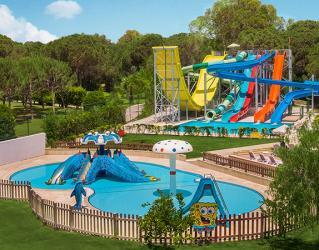 The resort is also in close proximity to 12 other popular golf courses in Belek. 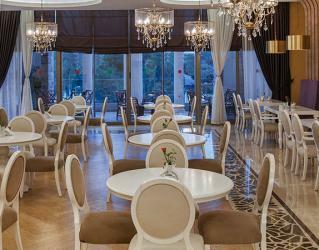 Offering a variety of dishes, Kybele Restaurant serves breakfast, lunch and dinner all year round. If you would like to dine in a more private atmosphere, you can make a reservation at one of the 4 A’la Carte restaurants within the resort. A selected menu of Italian cuisine is served in the Limone Restaurant, set in an elegant design to make you feel as though you are in Italy. 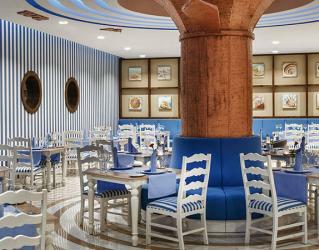 For seafood lovers, Mermaid Restaurant is an excellent choice with its vivid atmosphere and delicious dishes. For sweet cravings, the Patisseria awaits you with traditional tasty Turkish desserts, sweet snacks and more in a serene ambiance. In the summer season, Sini Restaurant, set in a traditional design, offers the most distinguished samples of the Turkish cuisine. Dragon Restaurant offers impressive presentations of sushi and legendary flavours of Chinese cuisines in its spectacular setting. While you are enjoying your day in the sun head over to Aspendos Food Court for a tasty snack. 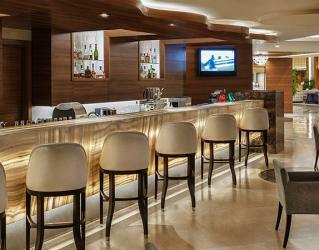 The selected menu of beverages within the all-inclusive concept is quite convenient for a cheerful holiday. 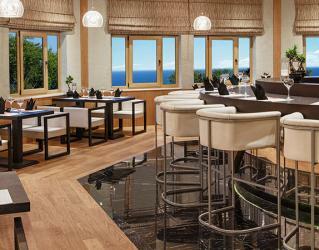 With a fascinating sea view on its terrace, Lobby Bar is in service 24 hours all year round. In the summer season, Aspendos Bar, Aspendos Night Club, Pool Bar and Pier Bar are open with refreshing drinks to cool off. *Please note that the availability of bars may change seasonally. Indulge yourself in one of the body care massages or therapies provided in Sanitas Spa for a rejuvenated body and soul. Enjoy complete relaxation after a busy day life, or relax your muscles after a few rounds of golf. 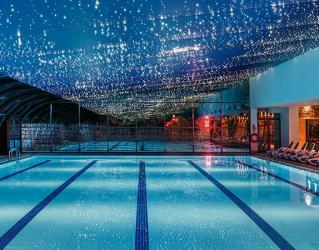 Try the traditional Turkish Bath, sauna and indoor pool to unwind to the maximum. The daily activities such as archery, badminton, zumba, darts, boccia, gymnastics, water polo, and wakeboarding will add fun to your days while on holiday. When the sun goes down, the “Aspendos Area” covering Aspendos Night Club and Aspendos Bar, offers entertainment with live music programs, dance performances, water shows and fun parties all night long. *Please note that seasonal changes and a service charge may apply for some of the activities. 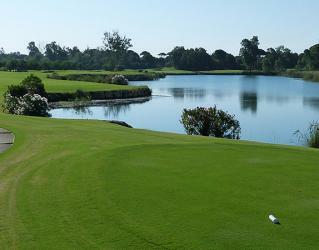 Opened in 2002, The Pasha is one of the 2 golf courses at Antalya Golf Club. With its wide fairways surrounded by woodland, it is a great course to play on. Throughout this 72 Par, 18-hole golf course, there are 57 bunkers and 6 lakes, with 4 tees to start from over a total distance of 5,731 meters. PLEASE ASK FOR OUR EXCLUSIVE GROUP DISCOUNTS! 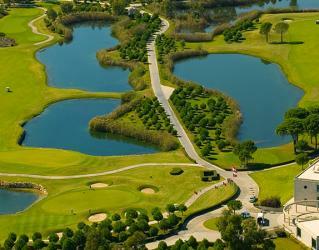 Opened in 2003, The PGA Sultan course is one of the 2 golf courses at Antalya Golf Club. Its fairways are long, narrow and challenging, surrounded by woodland. Throughout this 71 Par, 18-hole golf course, there are 122 bunkers approximately 30m2 in diameter each and 7 lakes, with 4 tees to start from over a total distance of 6,477 meters. This is simply to thank you and all the Bilyana staff we met during our stay at the Sirene Hotel last week for a thoroughly enjoyable golfing holiday. We were fortunate in having wonderful weather throughout the week and all eight of the party managed to complete our six rounds of golf successfully. The Smith and the Cowins are considering returning to Antalya in October. We would like to avoid the maintenance programme, so would be grateful if you would send us the details – if you have them. We are considering trying courses we have not played before. Perhaps you could let us know if any special offers exist at this time? Once again, many thanks for last week. I hope we will have a trip back again in October 2018. I will follow your offers to see. I can clearly see that again Belek has became more popular again. You can also see that on the prices for flights. So we will see, maybe..... 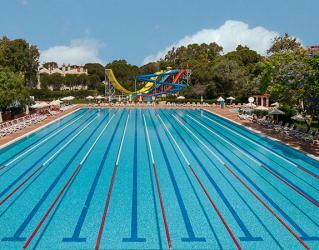 If so, it will be my trip number 20 to Belek!!!!! The trip was extraordinarily good. The hotel and golf "high above our expectations," and we were really satisfied of the trip. Thanks for everything and it was nice to meet you too! i have just returned from a week staying and playing Sirene , Sultan And Pasha ( 3.11.13 to 10.11.13). Your personnel is well aware i book through your company every year with never any major problems, apart from the odd darkness. I would therefore like you to pass our thanks to Derya and ensure she receives the plaudits she deserves, Along with Bilyana Golf Holidays. Please feel free to use any part of this email as a testimonial for your company and it's standards. I would also like to take the opportunity to Thank your crew whom organises our yearly event. I have been asked by all members of our party to convey our thanks to you and all the staff at Bilyana Golf for your kind help regarding our recent holiday at the Cornelia Diamond Hotel and the golf courses that we played. All the golf courses were superb especially The National and The Carya. I would like to add my personal sincere thanks to the driver and his colleague who took us back to the airport as I became unwell on the bus. The driver stopped the bus and both members of your staff made sure I was ok before carrying on to the airport - their helpfulness and attitude was a credit to Bilyana Golf. We have not decided our golf venue for 2017 as yet but I will contact you again should we come back to Turkey. 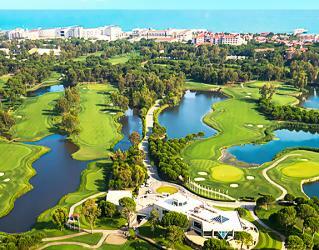 Last year you arranged a fantastic golfing holiday for 8 of us to the Sirene hotel in Belek. We all had such a great time - and your rep was wonderful throughout - that we would like you to quote us again for this year. thinking of going mid September or early October. We can arrange our own flights as before. Just returned from golf break organised thru Bilyana Golf. Stayed at the all inclusive Sirene hotel. Cannot fault the accomodation absolutely superb rooms. The food was excellent, as was the service. The staff were very friendly and attentative. 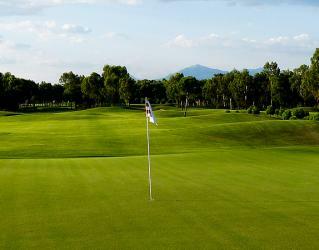 The Sultan & Pasha courses were in excellent condition and provided an excellent test. I would recomend this particular golf break to all my friends. Thanks to all at Bilyana & at the Sirene Hotel. I wanted to write to thank you for helping us organise a fantastic golfing holiday in Turkey. We have been back for a week now, and like my suntan, the memories are starting to fade! 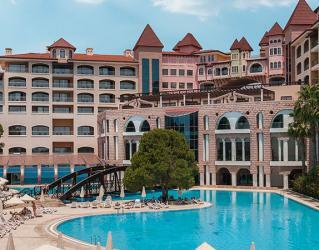 The Sirene Hotel was fantastic as usual and the Pasha and Sultan courses were in their usual immaculate condition. You can really see how much golf in Turkey has taken off by the huge increase in the numbers on the course, the last time we visited, the courses were pretty quiet - not anymore. All 10 of us had a fantastic time and hopefully it will not be too long before we organise our next trip. Thank you again for all the care and attention that you took over our booking. If and when we return, Bilyana will be the first company I turn to. 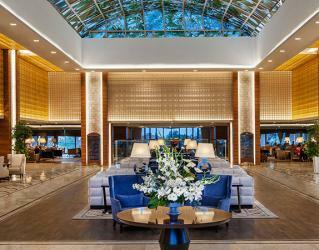 We just want to thank you and your team for making our trip to Belek so enjoyable. Everything was superb. 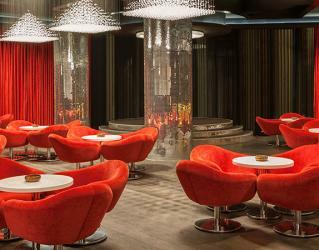 The Hotel Sirene was faultless as was the staff at the hotel. The new Years Eve gala was magical. We had a great time and met some very friendly people. Your staff were very helpful and friendly to us. 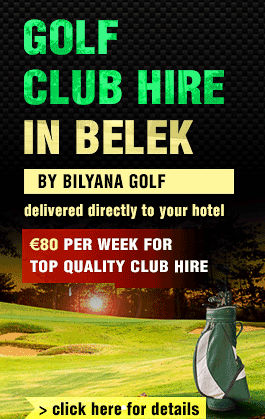 Thank you Bilyana Golf Travel. thank you for your excellent recomendation re. Sirene, the whole experience was first class and your guys, Your staff looked after us really well. I can tell you that it was the best organised holiday we have ever had, service, room, food, all A1 and the courses, Sultan and Pasha were beautiful. We will be back!! Year at the Sirene Hotel it was fabulous. New Year's Eve was brilliant the meal, the cabaret and the dancing. We were particularly impressed with the staff in the restuarant and bar throughout our stay and were suitably impressed with the golf courses. Thanks once again for making it the best New Year in years. We have just returned from our holiday to Belek and I just wanted to thank you and your company for the wonderful time that we had at the Sirene Hotel and Resort. The holiday booking was well arranged, by yourself. The Sirene was a terrific place to stay and your drivers were excellent. We really enjoyed the golf courses which we played and found staff everywhere to be so friendly and polite. All being well, we will certainly be coming back next year and will be in touch later. Please keep my credit card details on file for future use. I thought that I would e-mail you to compliment yourself and company company regarding our golf holiday at Sirene Hotel.We have had an excellent time in Turkey finding the hotel-- golf courses absolutely superb. Really everything about our holiday could not have been better.As this was our first time in Turkey we found the friendliness of all the hotel staff --golf course staff and indeed our rep very friendly and most courteous. Over the years we have travelled to various golf destinations Spain,Portugal,Tenerife,America etc. and we have to comment that this holiday has been our best experience so far.We will certainly return to Sirene and will most certainly recommend Bilyana to friends wishing to try golf in Turkey. In conclusion may I thank you for all your help and prompt replies to my e-mails. A truly professional company!! I look forward to booking with you in the future. We have just returned from our first hoilday in Turkey with Bilyana Golf and we were very pleased with the Sirene hotel and its staff. The golf was excellent we particulary liked the National course. We shall certainly return in the future. Many thanks for your help in arranging all this. I just wanted to drop you a line to say how very impressed we all were with our golfing week in Belek. Absolutely everybody in my party were delighted with the whole set up and it was great to have our private transport waiting for us at the airport when we arrived to take us directly to our hotel. The fact that it was an all inclusive package certainly made it all the more enjoyable. During the past 6 years when my group have travelled to Tunisia, it has always been a bit of a headache trying to sort out who owed what for when. This was made even less fun when the figures could only be done when the credit card bills arrived and the holiday was a distant memory!! For the golfers in my group, everyone thought that the courses were superb and a few of us (me being one) also managed to play The National and The Tat. Can you please say a huge thank you to your staff on our behalf. They was extremely helpful throughout and the most pleasant person to deal with. They organised the additional rounds of golf as well as arranging a day trip to Side for 6 of our group all of which were completely hassle free. It was a shame that I did not get to say hello to you while we were there but maybe we will get the chance next year. I think I can safely say that we will be looking to return to the Sirene for our golf trip in 2009 and maybe even make it a 10 day break as everyone said they would have liked to stay longer. Thanks again for all your help and I look forward to being in touch again later this year. Good luck with the rest of the season. Just a line to say thanks. We will definitely come again all of us enjoyed the golf and the marvellous service at the club. 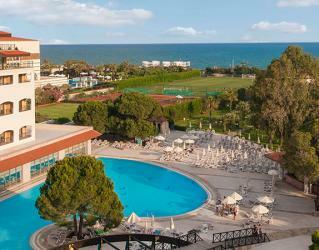 Sirene Golf Hotel was the best, great service, great food and wonderful facilities. Just to let you know that we all had a wonderful time at Hotel Sirene this year. I would like you to pass on our united thanks to your staff, the Bilyana representative, who did a splendid job on behalf of your company. I am writing to tell you that i have just arrived home from a 7 day golfing holiday staying at the Sirene complex, and would like to thank you and your Staff for what has been the best golfing trip we have experienced. All facilities including hotel, courses, staff were excellent. Everything went to plan and everything that you /your company were involved with was first Class. I would like to thank you and Bilyana for looking after us so well in during our holiday. I would like to give a special thanks to Your guide who was always extremely helpful and made everything happen so smoothly. We had a really good time - the Sirene hotel was excellent, the weather was perfect & we had lots of laughs. Maybe you could let me know when we should get in touch with you if we want to arrange another holiday in April next year. Many thanks for all your kind attention to our group, the Thomas Moran group from Scotland, during our stay at the Sirene Golf Hotel at Belek last week. 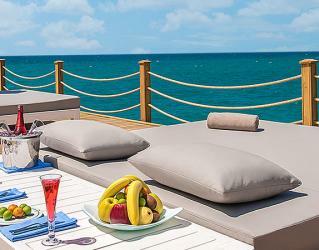 We would like to thank you for a wonderful holiday at the Sirene Golf Hotel. We where very impressed with the proffesional image of Bilyanagolf and the VIP service we received from the staff. We are recommending you to all our friends. We hope we will be able to vistit Belek again and of course, we would only travel with Bilyanagolf! 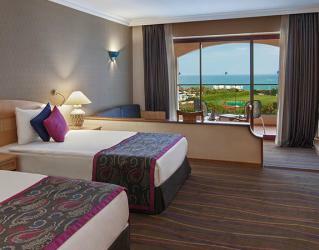 We all really enjoyed our holiday at the Sirene Golf Hotel. The service and facilities were top class as were the golf courses. I must thank you and your staff for making it all a very enjoyable experience. The transfers to and from the airport and golf courses were excellent and we all thoroughly enjoyed the evening out in Antalya with your guide who was a most entertaining host. I have already passed your details on to other golfers at my club so you may be hearing from them - I am sure they will not be disappointed.